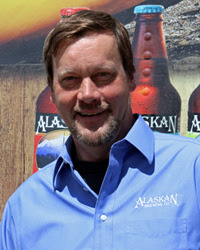 co-Founder Geoff Larson recently sat down for a few questions about the inspiration behind the beer he first brewed nearly 20 years ago. So what was the inspiration to put Sitka Spruce tips in a beer? Geoff: The historical inspiration behind Winter Ale came from Captain Cook. He had 14 separate references in his logs about Spruce and Beer. Not all the references were positive – at first he added full boughs of spruce, bark and all, and then wrote of a “mutinous crew”— so that batch was not appreciated! Then he wrote about adding only the new growth of the spruce, new shoots, and said this was an especially fine brew and this seemed to go over well with his crew. Was Spruce an ingredient you had heard about before reading the accounts of Captain Cook? Geoff: There was an awareness of spruce as an ingredient – homebrewers had been using spruce essence for years. But to me those always tasted piney and tarry – not hedonistically pleasurable, which is what I look for in beer! Things like jellies and spruce syrup which are pretty unique to this area of the world, caught the character of the spruce I was after – that berry-like quality with tartness and a high aromatic character – very different from the spruce essence beers I had tried. Once you had brewed a beer with Spruce tips, what did it take to put it into production? Geoff: A big hurdle was picking the tips – getting enough and at the right time. To make beer in the volumes we need – that’s a lot of tips. Marcy (Co-Founder and Geoff’s wife) hit on the idea of using Pep’s Packing out in Gustavus because they do food packing and processing out there and can handle that end of it, and they end up coordinating getting essentially the whole town of Gustavus out picking spruce tips right when they first bud out in early spring – which here in Alaska is beginning of June. Pep’s perfected the packing – there are a number of steps including a process of aerating the tips once they’re packed – we found out that freezing and vacuum packing needs to be done in the right order or the tips can spoil. Does that process, picking them locally in one small town, affect the quality of the Spruce tips? Geoff: It does in a very positive way that we didn’t anticipate. Because the people in Gustavus get excited by the prospect every year of picking this “cash crop,” they end up picking them quickly when they first bud, so during the “first flush” when the buds are being infused with that first flow of sugar-rich sap to promote the new growth. As a result, our tips benefit from being particularly tart and packed with flavor. Why did you choose the base style of Olde English Ale? Geoff: We actually first used spruce tips in our Old Growth Barleywine. I thought it was potentially how Capt. Cook might have brewed beer – in the method of creating “threads” on one brew – so the higher gravity first part of the mash was used for Barleywines, and then an Old English Ale, and then perhaps something with even less alcohol. After we did that Barleywine, I thought a nice cold-weather beer would be something fairly warming, but also mellow enough to have a couple with dinner. The Olde English Ale fit the flavor I was hoping to get and seemed like a likely style that Captain Cook would have been brewing.